With a few changes in the under $1,500 acoustic market, we decided to make a few amendments to our chart. This included removing a few models, such as the Manuel Rodriguez ACUT-U, and adding a trio of excellent models including the Martin 16 Series D-16GT, the Taylor 214ce DLX, and the Blueridge BR-160 to our steel-string section. We also added the popular Kremona Romida to our section on classical guitars. These days, opening your wallet to the tune of $1500 can get you a lot of guitar! But it’s tricky to actually define this price range… High-end? Mid-range? Affordable? It depends on your definitions of those labels, but to us it is a mix of all three. Not quite premium high-end, but way better than your average guitar, and still affordable for many people. What can you expect from the guitars that feature in the $1000-$1500 price range? Whatever you class this price range as, we’ve searched the current $1000-$1500 acoustic market and have reviewed some of the best performers – those guitars that make you go ‘wow’. There’s a good mix on offer – different designs, different woods, and different sounds. Some regular acoustics, some with electronics. In this article we’ve focused mainly on steel-string models, although have also highlighted a couple of our favorite nylon-stringed classical models worth checking out. An incredible solid-wood Martin dreadnought with great low-end. A stunning all-solid-wood 1930s throwback. Upgraded aesthetics on this deluxe electro-acoustic. A vintage guitar that oozes nostalgia, with huge projection – perfect for jazz. A beautiful premium signature model designed by Melissa Etheridge. 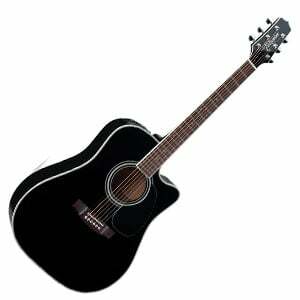 There’s a reason Bruce Springsteen uses this superb mid-range electro-acoustic model as his concert guitar – it rocks! 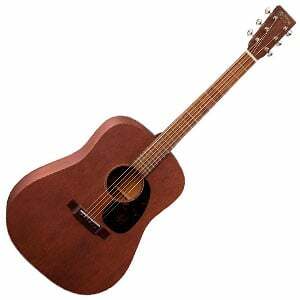 The popular EF341SC – part of Takamine’s Legacy Series – feature a dreadnought body with a solid cedar top and laminated maple back and sides. It’s all finished in a gorgeous high-gloss black, with classy white binding and detailing. The C-shaped neck is made from mahogany, and has a rosewood fretboard with 20 frets. There’s a warm and resonant natural sound, while Takamine include their CT-4B II preamp system, with their unique Palathetic under-saddle pickup, 3-band EQ, and a built-in chromatic tuner – a good friend to have when plugged in. Hard to fault this iconic performer! You can read more on the EF341SC in our full review. This price range is where you start to see more made-in-America Martins – and the D-16GT is a prime example of what the iconic acoustic brand can do with a certain budget. While not as premium as the Standard Series, this dreadnought is as high-end as many guitarists will ever venture – and you will be rewarded if you do! It features a beautifully simple dreadnought design, with a body made from solid Sitka spruce and solid mahogany on the back and sides. The detailing is understated but adds a level of sophistication to a guitar that is both fun to play and sounds amazing – so warm, with a big, bold bass response. Be sure to check out our in-depth look at the D-16GT! Rated very highly by general players and professionals alike – including Coldplay’s Chris Martin – this D-15M, which is part of Martin’s 15 Series, is worth paying attention to. It’s instantly apparent that the no-cutaway flattop dreadnought body is made entirely from mahogany – the top, back, sides and neck are all crafted from satin-finished solid mahogany, that looks and feels beautiful. The neck joins the guitar at the 14th fret and sports a solid East Indian rosewood fretboard, with 20 frets. As for hardware, the D-15M features open-geared nickel tuners and a standard bone nut and saddle. It’s a warm guitar in looks and even warmer in tone – full and rich, with warmth in abundance! You can read more details about the excellent D-15M here. The BR-160 from Blueridge is yet another striking model on this chart, with a distinctive design based on acoustic guitars from the pre-war eras. This can be seen in the detailing, with retro open-back tuners, a vintage-tinted finish, Dalmatian-style tortoiseshell pickguard, and herringbone binding – not to mention the elaborate headstock! The guitar also features an all-solid-wood construction, with Sitka spruce used on the top, along with rosewood on the back and sides, and a 20-fret mahogany neck. Ultimately, it’s a great looking dreadnought, which is matched by a stunning tone that oozes warmth – perfect for everything from country to folk. You can read more on the Blueridge BR-160 in the complete review. The kings of Grand Auditorium guitars are at it again! This time with the popular 214ce DLX – the deluxe version of the original 214ce. While the guitars both feature similar builds – including a solid Sitka spruce top and sapele neck – the upgraded DLX sports laminated rosewood back and sides, offering a touch of darkness to the already rich tone. As we highlight in the main review of the Taylor 214ce DLX, it’s the detailing that sets this acoustic apart, with features such as a high-gloss finish and diamond fretboard inlays adding sophistication. Throw in Taylor’s Expression System 2 electronics and a luxury hardshell case, and the 214ce DLX proves pretty good value for a higher-end model! The Loar – a brand whose catalog consists of beautifully nostalgic revivals of guitars from around the 1930s – find their way onto this list thanks to their beautiful LH-700. 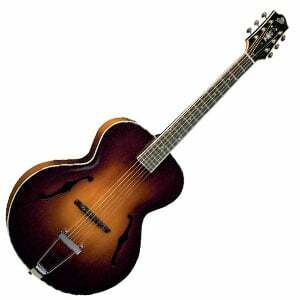 With a no-cutaway archtop shape and a scale length of 24.75”, the LH-700 features a solid hand-carved and hand-graduated AAA-grade spruce top, with back and sides crafted from solid AAA-grade flamed maple. Excellent woods, which lead to a delicious retro look. The neck is made from highly-glossed figured maple with a vintage V profile, and features a bound ebony fretboard and 19 frets, while the headstock sports gold Grover Sta-Tite open-geared tuners. The sound is something else – really resonant, well-balanced in tone, and more projection than you’d expect. Be sure to read our full review of the LH-700. The popular American singer-songwriter Melissa Etheridge has been playing Ovation guitars since the age of 14, so it makes sense that she would collaborate with the innovative brand to produce a delightful signature guitar that everyone can enjoy. As we elaborate on in the complete Ovation Melissa Etheridge Signature review, this steel-string model sports a classic Ovation body with AA solid spruce on the top and a comfortable Lyrachord composite bowl. 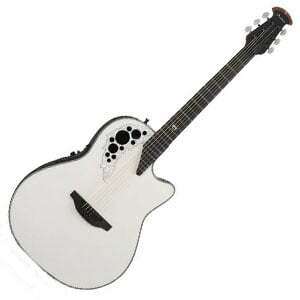 There are several eye-catching features, namely the ice white top finish and multi-soundhole decoration. The hardware is all-round excellent and the Ovation-designed electronics are pro-grade, with versatile controls and output, and a rich, robust sound worthy of stage performances. A beautiful classical guitar with the playability of a steel-string model. An elegant classical model from the masters at Kremona. A solid classical electro-acoustic entry from the famed Japanese brand. Love the feel of a steel-string acoustic, but want to explore classical guitar? This C10 Crossover is probably the nylon-stringed guitar you have been looking for! The reason being that the sleek mahogany neck features a C-shaped profile, a slim 1.88” nut width, and an ebony fretboard with a curved radius that all make for a feel that’s more familiar to steel-string players. The body of this guitar is pretty much identical to the original C10, with a solid fan-braced European spruce top and Indian rosewood back and sides. The guitar shows good value, especially when you consider the top-quality sound on offer – a big voice, with a well-balanced tone. Curious? Check out our full review for all the details of the C10 Crossover. Founded in 1924, the Bulgarian classical guitar brand Kremona has nearly one hundred years of guitar building experience to draw on, which results in flawless guitars such as the Romida. This exceptional nylon-stringed model is a great demonstration of what the master luthiers can do for under $1,500. It features an all-solid-wood build, with a combo of European spruce and Indian rosewood on the body, with a cedar neck and a 19-fret Indian ebony fretboard. The design is traditional, peppered with a couple of contrasting details and features that enhance the sophistication. As we explain in the full review of the Kremona Romida, the tone is impeccable – full and rich, with lasting sustain. Excellent! The renown steel-string manufacturers flex their nylon-string muscles with this attractive TC132SC electro-acoustic classical guitar, which shows off great value. With a familiar classical body shape and single cutaway, the fan-braced top is made from solid cedar, the back is solid rosewood, and the sides are made with a rosewood laminate. The neck is great to play with, and is made from mahogany, with a nut width of just over 2”, a rosewood fretboard, and 19 frets – all easily accessible. As for hardware, the TC132SC is loaded with Takamine’s innovative CTP-1 CoolTube preamp system, with versatile controls, allowing the warmth of this guitar to be amplified naturally. Be sure to check out our full review of the TC132SC. When you’re spending up to 1.5k on an acoustic guitar, you know the product should be pretty flawless – a serious guitar capable of stage performances and studio recording, offering a professional-grade sound, and sporting a body and hardware that won’t let you down. 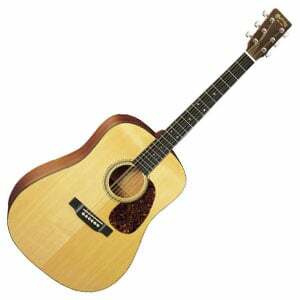 Brands including Taylor, Martin, Takamine, Cordoba and Kremona all crop up time and again in this mid/high-end range. And while the charts above are far from comprehensive, you can rest assured that those guitars that feature are there for a reason. From manufacturer to manufacturer, the actual woods, components and electrics, will obviously change drastically, but you will see some familiar woods used on bodies – cedar, spruce, rosewood, mahogany, as well as some more exotic woods like Hawaiian koa. In this price range you find more use of solid woods and less laminates, although some guitars will mix and match (solid wood top and back with laminate sides, for example). And even though many of the guitars you’ll find may come from workshops in China, Japan or Mexico, the craftsmanship still impresses and more often than not stands up in quality to models built in American workshops. Sounds will differ completely too, and will depend on the woods, construction methods and – in the case of electro-acoustics – amplification systems used. For example Martin’s D-15M is one of the warmest guitars we’ve heard in this range, while the similarly priced 224ce-K from Taylor is at the opposite end of the tonal spectrum – incredibly bright. Hardware should also keep you performing to a high standard. You should see quality tuners with high gear ratios, good string, bone nuts and saddles, and quality wooden bridges. Finally, with the exception of a few, the guitars in this price range should come shipped with a complimentary hardshell or hybrid case. The models that feature in our chart just go to show that you don’t have to spend a fortune to get a great guitar. But it also shows that if you are willing to spend a little extra on something that’s more than $1000 you are almost guaranteed to end up with a guitar that you’ll keep for a lifetime – something a little different, something that allows you to perform, and something that makes your friends a little jealous! Don’t forget that this chart is just our opinion, and will change from time to time as different guitars are introduced to the market – prices change, and something that was in a high-end category yesterday, may fall in price and end up on this page tomorrow!